School Hours:Tuesday--Thursday 11:00--8:00, Friday 11:00--5:30, and Saturday 9:00--4:00. Workshops are 60 minutes long and can be booked for any venue from corporate team-building to Music Festivals. 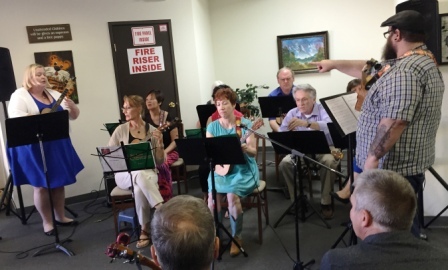 Participants need their own ukuleles and music stands. Cost is $15 per person for each workshop. Julie Holloman is available to teach Beginning Ukulele, Ukulele Strum Patterns, Ukulele Traditional Fingerstyle, Beginning Flamenco for Ukulele, and Intermediate/Advanced Flamenco for Ukulele. Evan Stern is available to teach Beginning Ukulele, Playing Bass for the Ukulele Player, Ukulele Strum Patterns, Rhythm Training for the Ukulele, and Beginning Fingerstyle for Ukulele. Aria Ukulele Class Beginners meets every Tuesday from 6:00--7:30 p.m. Age 16 and up. Skill level is beginning. No previous experience required, but the semester begins on May 7 2019 and the skill level increases each week. This session will continue until August. There is a $15.00 drop-in fee, or you can register through TMCC. Strum, sing, and learn to read music using the James Hill Method Book 1. Aria Ukulele Class Intermediate meets every Thursday from 6:15--7:15 p.m. Age 16 and up. Skill level is intermediate. Previous experience required. Class begins on May 9 2019 and the skill level increases each week. This session will continue until August. There is a $15.00 drop-in fee, or you can register through TMCC. Increase your ability to strum, sing, and learn to read music using the James Hill Method Book 2. Aria Ukulele Class Intermediate/Advanced meets every Saturday from 10:30- 11:30. This is for students who have taken the beginning course. A basic understanding of reading music, music theory, and playing basic chords is required. Strum, sing, and read music using the James Hill Method. There is a $15.00 drop-in fee. Aria Ukulele Class Advanced meets every Saturday from 9:00--10:00 a.m. Age 16 and up. Must know how to read music, understand music theory, have basic chords memorized, understand moveable chord shapes, Play in 5th position, handle advanced strumming and part-singing.. There is a $15.00 drop-in fee. Strum, sing, and read parts using the James Hill Method. 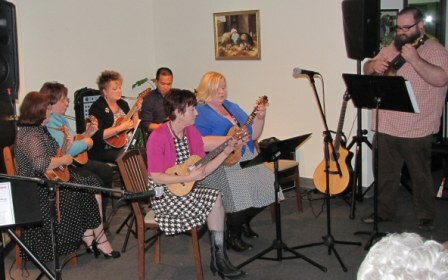 Reno Ukulele Group meets every Wednesday from 6:30-8:00 p.m. All ages are welcome and skill level is beginning/intermediate. There is a $3.00 drop-in fee. Sing and play all styles of music to your heart's content. Aria Musicianship Class meets every Wednesday from 5:30-6:00 p.m. Improve your ukulele playing skills with scales in all keys, playing scales and chords up the neck, chord construction and advanced music theory. $Donation appreciated. 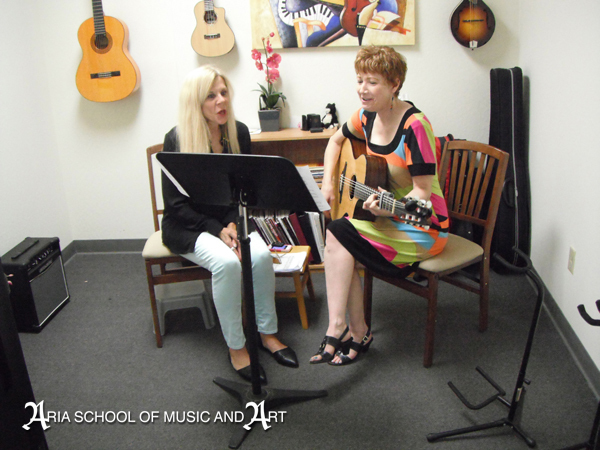 We offer private lessons on guitar, piano, voice, violin, viola, cello, bass, electric bass, banjo, mandolin, and ukulele. Basic Private Lesson: 30 minutes once a week. Advanced Private Lesson: 45 minutes or full hour lesson once a week. Cost: Basic 30 minute private lesson is $29.00. Students pay for the entire month by the 9th of each month. Total cost per month varies from $116.00--$145.00 depending on the number of lesson days in the month. Please call 829-2742 to set up a tour or schedule lessons.